Teaser Tuesday is a weekly meme, hosted by MizB of Should be Reading. I close my eyes and focus on breathing. "You can talk to me. Just don't touch me." 7 seconds of silence join the conversation. "Maybe I want to touch you." There are 15,000 feelings of disbelief hole-punched in my heart. I'm tempted by recklessness, aching aching aching, desperate forever for what I can never have. There's just something about this part that really caught my attention. Maybe it's just the feeling of shattering I felt for Juliette when Adam said this to her. I'm loving this book. It's constantly pulling on my heart strings, making it hurt. It's fabulous. Feel free to share your teasers! I'd love to see what you're reading. This is such an incredible book! I was literally speechless for several days after reading this, it was so amazing. :) Perfect choice for your teaser...such a poignant moment for Juliette. great teaser. It sounds so sad. Interesting. I'm going to have to add this to my pile. Thanks for stopping by my blog! This book is high on my to-read list. I really need to get on it already. Great teaser! I've heard of this book and it's my tbr list :D I hope you're enjoying it! Have a nice day! I keep seeing this book. Great teaser. Thanks for visiting. Awesome teaser from an awesome book! I just love Tahere's prose. The way Juliette calculates everything with numbers, and zomg the crossed out phrases! Love love love! I loved this books so much! I cannot wait for the next one! Thank you for sharing such a beautiful teaser, and for stopping by my teaser! I have this gook on my shelf. I was just thinking about how I need to read it. Great teaser. Great teaser! 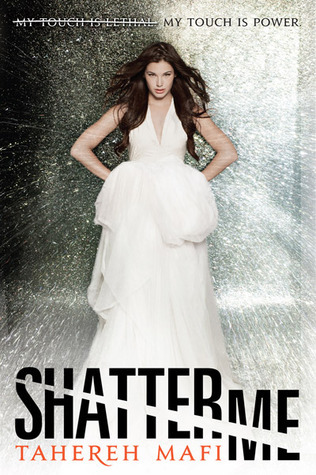 I so loved Shatter me. One of the best books I have read. I hope you did enjoy it.